The Florida state saltwater fish is the Sailfish. 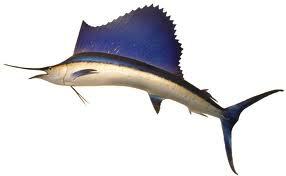 Sailfish are found nearly everywhere there is warm ocean water. However, Florida sailfishing is legendary, especially in the Fort Pierce, Miami, and Keys areas during colder months. Sailfish migrate southward as the weather chills in the north. The sailfish can reach speeds of sixty m.p.h. The average size of sailfish found in Florida is approximately six to seven feet and thirty to forty-five pounds. The 1975 Florida legislature adopted the Atlantic sailfish as the state’s official saltwater fish.